High northern terrain on Titan is made visible by some image processing sleight of hand. 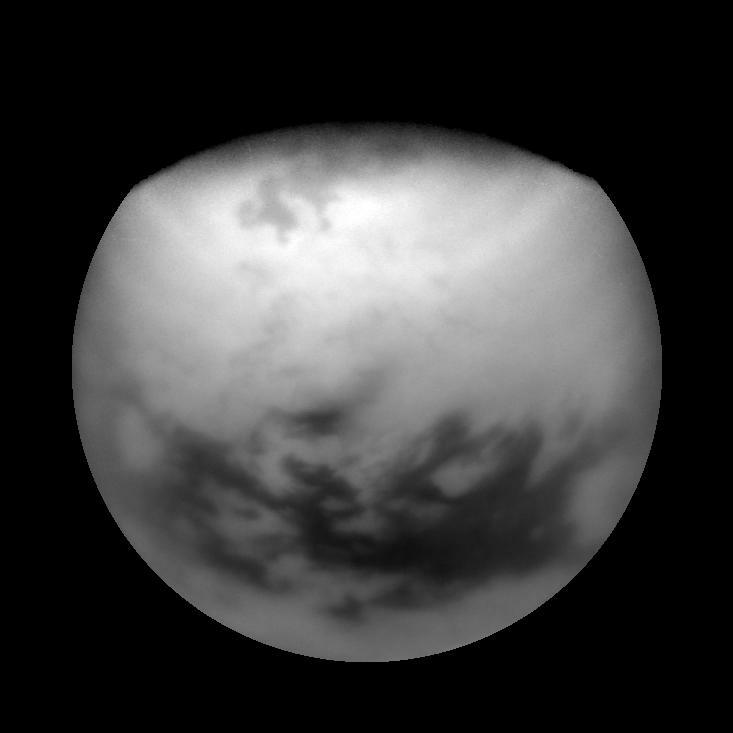 The view is the product of a ratio between Titan images taken using two different spectral filters. This process improves the visibility of surface features on Titan by removing the effect of shading from differing lighting angles. Features nearest the terminator (the line between night and day) receive the greatest improvement in terms of visibility. In this particular frame, the process also makes visible features beyond the terminator. These features are illuminated by scattered light in the atmosphere, as during twilight on Earth. By this processing technique, surface features near the north pole can be viewed a full year-and-a-half before they are illuminated directly by the Sun. In most processed views of Titan, this ratio procedure produces images that show only the surface, and indeed, most of the features visible here are on the ground. However, the high altitude haze layers in Titan's north polar region are darker in the shorter wavelength image used to create this special product. This difference in brightness results in the bright latitudinal band seen here. The banding in the north polar haze layers can be seen in PIA08907 . In the high north lie the large, dark features thought to be seas of liquid methane or ethane. Along the bottom of the image are Titan's equatorial dark regions, also thought to be seas -- but instead of liquid, they are seas of longitudinal dunes. The view is toward terrain centered at 34 degrees north latitude on Titan (5,150 kilometers, or 3,200 miles across). The image was taken with the Cassini spacecraft narrow-angle camera on March 29, 2007 at a distance of approximately 1.5 million kilometers (900,000 miles) from Titan. Image scale is 9 kilometers (6 miles) per pixel. Due to scattering of light by Titan's hazy atmosphere, the sizes of surface features that can be resolved are a few times larger than the actual pixel scale.